Most adults suffer from memory problems. Especially older adults who are the largest growing population shows the biggest decline. A healthy diet, exercise and social interactions have proven to have improving effects on not only for memory but also for other cognitive systems’ performance. 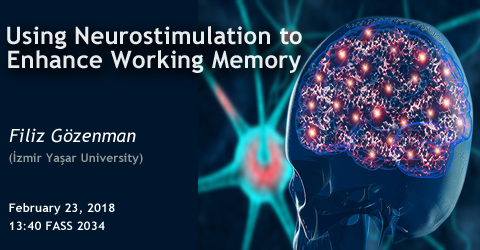 In addition, neurostimulation techniques such as transcranial Direct Current Stimulation (tDCS) shows growing translational promise to enhance Working Memory (WM). WM permits maintenance of information over brief delays and is an essential executive function. Unfortunately, WM is subject to age-related decline. Some evidence supports the use of transcranial direct current stimulation (tDCS) to improve visual WM. A gap in knowledge is an understanding of the mechanism characterizing these tDCS linked effects. In this seminar, I will talk about our findings regarding to close this gap and further demonstrate how tDCS could be useful for everyone.